Much has been written about the need for strontium in reef aquaria. Some authors have described it as an important additive,1 while others have described it simply as a poison.2,3 Why are there such divergent opinions on strontium? Partly this is because there have been few, if any, scientific studies of the effects of depleted strontium on organisms that most reef aquarists maintain. Partly too it may be because many aquarists confuse the idea that an organism “needs” an ion in solution with the idea of “needing a supplement.” Finally, I think many authors have, perhaps incorrectly, extrapolated observations from one or more reef aquaria to others that may have a totally different strontium balance. This article on strontium is the second of several that delve into a variety of issues involving magnesium and strontium. Calcium, magnesium, and strontium are very similar chemically. So similar, in fact, that they get in the way of each other in a variety of situations, and that is part of the reason why these ions merit interest by aquarists. This article details the nature of strontium in seawater, and it describes which marine organisms are known to need strontium and for what purpose. It also describes which marine organisms are known to take up strontium (such as corals), whether they “need” it or not. Finally, it describes how strontium is added, measured, and removed from marine aquaria. Next month I hope to extend these articles with an analysis of how much magnesium and strontium are delivered to aquaria in limewater (kalkwasser). My aquarium has not become depleted in strontium despite not having added strontium supplements for several years. Combine this practice with the fact that calcification is known to remove strontium from solution, and one can only conclude that strontium must be entering my aquarium in some way. Limewater seems the most likely way, and I’ll report on such matters next month. In full strength seawater (S=35), strontium is present at approximately 90 μM (μM is short for micromolar, which is a measure of the actual number of ions present, as opposed to ppm (parts per million), which is a measure of the mass of ions present). By concentration, it is the fifth most abundant cation (positively charged ion) behind sodium (Na+; 469,000 μM), magnesium (Mg2+, 53,000 μM), calcium (Ca2+; 10,300 μM), and potassium (K+; 10,200 μM). In mass units, it is present in seawater at about 8 ppm. Strontium, with a molecular weight of 87.5 grams/mole is significantly heavier than calcium (40 grams/mole) or magnesium (24.3 grams/mole). In physical size, a strontium ion is about 13% larger than a calcium ion, and 70% larger than a magnesium ion (Figure 1). Figure 1: Comparison of the size of various ions. 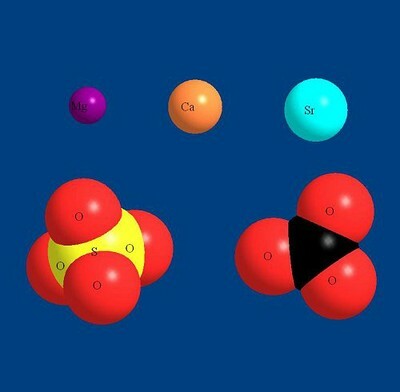 Clockwise from the top left, these are magnesium (Mg2+), calcium (Ca2+), strontium (Sr2+), carbonate (CO32-), and sulfate (SO42-) ions. Strontium is present in seawater as the Sr2+ ion, meaning that it carries two positive charges, just as calcium and magnesium do. Most of the strontium is present as the free ion, with only water molecules attached to it.7 A small portion (about 10%) of the strontium is present as a soluble ion pair with sulfate (SrSO4), and much smaller portions are paired with bicarbonate (SrHCO3+), carbonate (SrCO3), fluoride (SrF+), borate (SrB(OH)4+), and hydroxide (SrOH+).7 Habib Sekha (owner of Salifert) has suggested that strontium in seawater may be ion paired to sulfate to a much greater degree than suggested above, but I have not seen strong evidence to support that hypothesis. The average residence time for a strontium ion in the ocean is on the order of 10-20 million years.7 That time is similar to magnesium (20-50 million years) and is substantially longer than that for calcium (a few million years) and aluminum (100 years). It is also substantially less than sodium (about 250 million years). In a certain sense, this is an indication of how reactive strontium is: it stays in seawater a long time because it’s fairly unreactive, but it does get taken out of solution through various biological and chemical processes more readily than sodium does. How does the reactivity of strontium compare to calcium and magnesium? As mentioned in the introduction, they are all very similar chemically. Size is the primary difference, and that size difference actually causes some chemical differences, especially the solubility of certain strontium salts. Strontium carbonate (the primary crystalline form of which is called strontianite) is less soluble that calcium carbonate, which in turn is less soluble than magnesium carbonate. In part, this may be the reason that strontium gets into calcium carbonate skeletons of organisms, as is detailed more below. Interestingly, strontium sulfate (also known as celestite) is much less soluble than calcium sulfate and magnesium sulfate. While none of these are actually saturated in seawater, strontium sulfate is close, at 30% of saturation.8 That difference is important, and in fact some organisms (such as the acantharians mentioned above) use strontium sulfate as a skeleton (which is detailed more below). One of the main users of strontium in the ocean are the Acantharia.4, 9-16 These beautiful, free floating unicellular microorganisms are related to radiolaria. They have radiating spines of strontium sulfate that are largely external to the central cytoplasm. Inside the “body”, the spines are connected. The end result is something that looks like a microscopic sea urchin. Are there Acantharia in reef aquaria? I don’t know. In aquaria that use natural seawater they might be seeded into the aquarium every time there is a water change. If there are appreciable numbers in some aquaria, then they might well provide a significant sink for strontium in those aquaria. In fact, they could cause rapid depletion of strontium. In other aquaria, for example those that use heavy skimming and artificial salt water, the likelihood that they are present in important numbers is likely much smaller. This potential difference between aquaria is one of many ways that the strontium balance may vary between different aquaria. Certain species of radiolaria also use strontium sulfate, despite having silica skeletons. The radiolarian Sphaerozoum punctatum, for example, release flagellated swarmers during reproduction which contain crystals of strontium sulfate (celestite).17-19 These crystals are deposited inside a cytoplasmic vacuole, and have a 50-100 nm thick coating of organic material on it. This coating may reduce the likelihood of dissolution of the celestite, and may be a clue as to how the Acantharia keep their strontium sulfate spines from dissolving. What purpose these crystals serve to the S. punctatum is unknown, but it may be an antipredatory defense. Some gastropods, such as the sea slug Aplysia californica, have a clearly defined requirement for strontium in the water. When they are grown in artificial seawater lacking strontium, they develop deformed shells and statocysts (that lack a statolith).20 Statocysts are balance organs in many invertebrates. They consist of a fluid-filled sac containing statoliths that stimulate sensory cells and help indicate position when the animal moves. Statoliths themselves are small solid granules, and are made largely of calcium carbonate in Aplysia californica. These organisms are quite sensitive to reductions in strontium, with a drop of only 1 ppm causing a detectable difference in development. For this organism there is a critical window of strontium exposure around day 4 of its life. Strontium added after that point cannot make up for the poorly developed statolith, which causes erratic swimming. As in Aplysia californica, strontium appears to be important to the development of at least 7 species of cephalopod.23,24 In all of these, the aragonite statolith develops properly in artificial seawater containing 8 ppm strontium, but not in artificial seawater from which strontium is absent. The end result for cephalopods raised in seawater lacking strontium is uncontrolled swimming due to the poor statolith development. For cuttlefish ( Sepia officinalis ) the cuttlebone also develops improperly in the absence of strontium. Intentional for positive reasons. That is, the strontium serves a useful purpose. Perhaps the purpose is to initiate or maintain calcium carbonate precipitation in some fashion. Some organisms described above clearly fall into this category. Intentional for negative reasons. That is, the organism wants to get rid of potentially toxic strontium and depositing it into a CaCO3 skeleton is one way to accomplish that task). Accidental. That is, the deposition of strontium serves no real purpose for the organism, but is simply the result of the fact that strontium looks rather like calcium, and gets into pathways intended for calcium and becomes deposited into the skeleton. This is obviously the way that strontium gets into abiotically deposited calcium carbonate. In any case, there are many fascinating studies reported related to strontium in corals and other calcium carbonate deposits. While many of these are only tangentially related to aquarium issues, some of the basic issues are important for understanding the strontium balance in aquaria. “Analyses of limestones, reef cores, limestone precursors, and fossils indicate that replacement and recrystn. lower the Sr/Ca ratio”. This fact is important because if calcium carbonate is the ultimate basis for calcium additives to aquaria (such as CaCO3 in CaCO3/CO2 reactors, or CaCO3 heated to form lime that is later used to make limewater), then the amount of strontium present in these ancient deposits will control the amount getting into aquaria. If these deposits are deficient in strontium, then an aquarium using them may also become deficient. “…reef corals, and green aragonite algae all have high Sr/Ca ratios that may be related to rapid deposition of carbonates associated with photosynthesis processes”. Again, if reef corals are not the ultimate source of CaCO3 used to make calcium supplements, then the levels in the aquarium may drop over time, just as in (1). In this case, if the organisms used to make the original CaCO3 are not the same species that are depositing CaCO3 in the aquarium, then the relative amount of strontium in the supplement may be too high or too low, allowing the aquarium to become enriched or depleted over time. The same could be said for the deposition temperature. Many recent studies have shown the Ca:Sr ratio for many corals at typical tropical reef temperatures and at normal seawater strontium concentrations to be in the range of 100:1 to 120:1. When looked at very closely, it has been noted that corals do actually seem to incorporate slightly more strontium than happens abiotically under the same temperature and ambient strontium conditions (about 103:1 (at 25 °C).25 Is that because the corals “want” the strontium? Or just an artifact of the pathway that corals use to get calcium deposited29 into calcium carbonate? The answer is unknown, but there are a few clues buried in other studies, and these are described below. The several possible reasons for corals to take up strontium were presented earlier in this article. These reasons range from needing strontium for some purpose, through not caring one way or the other about strontium, to depositing it only as a means of eliminating it from their bodies. What does the scientific literature have to say on this subject? Unfortunately, not enough. There has never been a published study that showed exactly what happens to the health of corals (as measured via calcification rates or any other means) when strontium is absent. There have been numerous studies that have shown what happens when strontium is raised above natural levels. In those studies, the amount of strontium incorporated rises linearly with strontium concentration up to at least 300 ppm in Stylophora pistillata.30 It has also been shown that calcium and strontium uptake may use the same pathways, since they are both inhibited by the same organic molecules that block certain protein transporters.30 Depending on the conditions, calcification can increase on adding extra strontium, as it does with added calcium.31,32 Nevertheless, these studies say little about whether natural levels of strontium are important for normal calcification. Another study examined in microscopic detail where the strontium is located in Galaxea fascicularis.33 They found that strontium was significantly enriched in the mucous layers. They propose that the strontium is used to neutralize (thanks to its +2 charge) the highly anionic (that is, negative charged) individual mucin glycoproteins. Once neutralized, the mucin can condense into functional mucin granules. These glycoproteins are highly sulfated, and if one were selecting a cation to bind to and neutralize the mucin, one might well select a divalent ion with a preference for binding sulfate. That is exactly what strontium provides, recalling the fact mentioned above that strontium sulfate is much less soluble than either calcium or magnesium sulfate. The authors also go on the state that the mucin layer itself may play an important role in ensuring that calcium is delivered to the ectodermal cells. That is, it helps maintain an artificially high calcium concentration near the surface of the ectodermal cells. This process would help what is otherwise believed to be a limiting factor in calcification: the active transport of calcium. Whether this hypothesis is valid or not remains to be established. Nevertheless, it has, for the first time, provided a plausible mechanism for corals to benefit from strontium. The table below summarizes some of the toxicity data that is known for strontium to wholly marine organisms (that is, those that do not spend any part of their lives in freshwater where they might be more sensitive to ionic toxins. For example, certain freshwater organisms are killed by strontium at levels far below those found in natural seawater). The most sensitive organism in table 3 appears to be a crab, with 38 ppm strontium reported to be lethal. If that experiment is valid, then aquarists would be cautioned to keep strontium from rising much above natural levels. NOTE: The LC50 is defined as the concentration at which 50% of the organisms die in the specified time. In a study of 23 marine aquaria, Shimek37 showed that the strontium levels ranged from 4 to 10 ppm, with a mean of 6.8 ppm. Some of these aquarists were likely adding strontium supplements, and some not. My own aquarium, where I have not added any strontium supplements in several years, has a strontium level of 15 ppm (measured by ICP, a technique describe later in this article). That 15 ppm strontium matches my measured value for the Instant Ocean salt mix that I use. What can be concluded from this data? One obvious conclusion is that some aquaria will maintain strontium levels in the absence of any specific strontium supplements. That result may not apply to all aquaria, however, for the various reasons given throughout this article. Nevertheless, the strontium level in my aquarium is high enough without supplements that I would not like to see it raised. Consequently, I would not recommend that any aquarists add strontium under the assumption that it is low, unless they have actually determined that it is low. One other comment on strontium in marine aquaria: It has been claimed that strontium is a poison, and was attributed by Shimek 2,3 to be the likely causative factor in the deaths of a wide variety corallimorpharians (mushrooms) in a reef aquarium when the strontium level was raised over a two week period to double natural levels. That certainly could have been the case, but I do not believe that in general a strontium concentration at 2X natural levels is toxic to typical corallimorpharians that aquarists maintain. I have many different species in my aquarium with 2X natural levels of strontium, and most grow quite rapidly, some even being at the pest level. I’ve never had one quickly die after adding it to my aquarium. Perhaps the corallimorpharians that he is referring to actually died from something else. The original source of strontium in aquaria is the artificial or natural seawater used to set up the aquarium, and with which any water changes are performed. Some artificial salt mixes have been reported to be slightly elevated in strontium (9-18 ppm)38 while others had levels comparable to natural seawater (~ 8 ppm). None in that study were deficient in strontium. My own analysis of artificial seawater made using Instant Ocean at a salinity of S=35 showed about 15 ppm (the previous study showed about 17 ppm). Based on the toxicity data presented above, it would seem to be beneficial for these salt mixes to as closely match 8 ppm as possible, and not have elevated levels. The other major source is calcium supplements. Many of these supplements contain strontium, either by “accident” (as in the case of calcium carbonate with impurities of strontium carbonate that is used in CaCO3/CO2 reactors) or because strontium is intentionally added by manufacturers. In the case of commercial calcium supplements, some manufacturers add strontium to some of them. Seachem, for example, adds strontium to Reef Complete and Reef Advantage Calcium, but not to their other calcium products. These two products contain a molar ratio of about 2185:1 (calcium to strontium). As will be seen below by comparison to other methods, that value is within the wide range of ratios provided by typical media used in CaCO3/CO2 reactors. How much is an optimal amount to add, however, is not entirely clear, and this “problem” of matching the input of strontium to the export is discussed in detail below. Other manufacturers, such as Kent, do not add strontium to any of their normal calcium-only supplements. Nevertheless, these supplements will all contain some strontium. The question is how much. In the case of limewater, it is not apparent how much strontium is present. I hope in the near future to report on how much strontium is present in solid lime, in the clear limewater, and in the residue at the bottom of a limewater reservoir. Striking a perfect balance between strontium input and export, even when using a CaCO3/CO2 reactor, may require measurements and adjustments. The argument that using ground up coral skeletons in a CaCO3/CO2 reactor will supply exactly what corals need is too simplistic. Different sources of calcium carbonate have different amounts of strontium in them. In testing of samples used by aquarists, Bingman39 reported a Ca: Sr ratio of 15,385:1 for Korlith and 7143:1 for Super Calc Gold. Similarly, [Hiller]40 reported 2732:1 for a quarried limestone and 1379:1 for Nature’s Ocean brand crushed coral. These values are all FAR below the amount of strontium taken out by calcification, which is more typically like 110:1 for calcification by corals and 100:1 for abiotic precipitation of aragonite (although the exact value for each of these depends on the ambientstrontium concentration, the temperature, and the species involved).25 If these reported values are actually real, and not in some way an artifact of the testing procedures, then it would seem that using such media would soon lead to depletion of strontium (in the absence of strontium additives). A different way to get a handle on the strontium being added this way is to look at how much strontium is added to aquaria each year using these media. If one were adding 16 ppm of calcium (and necessarily 0.8 meq/L of alkalinity) every day for a year (the equivalent of 2% of saturated limewater every day, but instead using these media in a CaCO3/CO2 reactor), the following species would be added to the water. Table 2. Cumulative amount of calcium, magnesium, and strontium added to a reef aquarium over the course of a year using a CaCO3/CO2 reactor. From this table it is clear that the amount of strontium added each year can be significant compared to the natural level of 8 ppm, but it does not have the same huge turnover that is present in calcium. Consequently, the amount of strontium coming from other sources, such as the salt mix itself, may actually dominate the additions. Another potential source of strontium is fish food. Strontium is present in many such foods, but not enough to have a significant impact on typical levels of strontium (~8 ppm). Table 2 shows some data from Shimek41 that have been recalculated to show the effect of adding 5 grams of food per day to a 100-gallon aquarium for a year. The effect on strontium of 0.01 – 0.7 ppm assumes that all of the strontium goes into solution. Whether that actually happens or not is moot as the total contribution to strontium is small. Also shown in Table 3 are the same data for calcium, showing that some foods could add a significant amount of calcium to reef aquaria. The primary sink for strontium in aquaria is coprecipitation with calcium carbonate. This occurs in organisms and also during the abiotic (non- biologically driven) precipitation of calcium carbonate (such as on heaters). It is anticipated that strontium is removed at a rate of about 1 strontium atom for every 100 calcium atoms. How much does this end up being? Using the same assumptions on calcification rates that were used for sources of strontium above, we can make some ballpark estimates. If one caused the deposition of 16 ppm of calcium (and necessarily 0.8 meq/L of alkalinity) every day for a year (the equivalent of 2% of saturated limewater every day), then at 100:1, the amount of strontium removed in a year amounts to a whopping 127 ppm of strontium. That amount dwarfs the strontium inputs described above. How can that be? Why doesn’t the strontium disappear in short order (i.e., a month or less)? Why were the strontium levels in tested aquaria no lower than 4 ppm? Even at 4 ppm Sr2+, the Ca:Sr deposition ratio should be on the order of 200:1, since incorporation is approximately linearly related to the Sr2+ concentration. Could the answer be water changes using salt mixes with adequate or elevated strontium? That wouldn’t seem to supply enough at typical change rates of 5-20% per month. Strontium supplements? Maybe. Perhaps in the case of aquaria using limewater, the limewater delivers enough strontium to balance this export. Perhaps in aquaria, with organic levels higher than in seawater, much of the strontium is bound to organics, reducing its availability to corals? Perhaps the previously reported tests of strontium levels in reactor media were flawed somehow. Perhaps my assumptionsare flawed somehow. I don’t presently know the answer(s). There are a variety of commercial supplements for strontium. I would use a pure strontium supplement (sold by, for example, ESV, Seachem, Kent, and Warner), as opposed one that is tied to other ions that may have no relationship to the need for strontium. I also would not use one unless the aquarium was determined to be low in strontium. There are two primary ways to test for strontium in aquaria. The first is to use one of the two commercial test kits available. These are made by Seachem and Salifert. Both are complicated tests, which is not surprising as it is difficult to measure strontium against a large background of chemically similar calcium and magnesium. I’ve not used either of these kits for several years, and have not used the current version sold. I hope to review the current commercial kits in the future. A second way to measure strontium is to use the type of equipment available in commercial analytical laboratories, such as ICP (inductively coupled plasma) and ICP-MS (inductively coupled plasma-mass spectrometry). In ICP, the water sample is sent into a very hot plasma. The individual ions then emit light because they are so very hot. ICP is very sensitive to strontium (quantifiable down to about 0.002 ppm) due to a very strong emission from strontium at 408 nm. I have used ICP myself to quantify strontium in my aquarium (15 ppm) and in the Instant Ocean salt mix that I use (also 15 ppm). My recommendation is to maintain strontium in reef aquaria at something approaching natural levels. There is no evidence that strontium at these levels in detrimental to any marine organism (although it might be). There is strong scientific evidence that some organisms need strontium, albeit not the organisms that most reef keepers maintain. Finally, there is anecdotal evidence from a number of advanced aquarists that depleted strontium is detrimental to the growth of corals that many aquarists maintain. How is one to maintain natural levels? That, of course, necessitates a suitable test for strontium. Perhaps the test kits are suitable for this purpose. If not, sending a sample out to a lab might be a reasonable alternative for some aquarists. If the result comes back in the 6-15 ppm range, there is not likely any action that needs to be taken. If the level is higher than 15 ppm, reducing the strontium levels via water changes with a suitable salt mix may be the best method. If strontium levels are below 6 ppm, adding a strontium supplement may be in order. Remember: in my aquarium without any recent strontium additions, strontium was already elevated above natural levels. I would not like to see it get any higher. Consequently, adding a supplement in the absence of knowing the strontium levels is not advisable. Seawater strontium and Sr/Ca variability in the Atlantic and Pacific oceans. de Villiers, S. Department of Geological Sciences, University of Washington, Seattle, WA, USA. Earth and Planetary Science Letters (1999), 171(4), 623-634. Barium and strontium concentrations in Pacific and Mediterranean seawater profiles by direct isotope dilution mass spectrometry. Bernat, Michel; Church, Thomas; Allegre, Claude J. Inst. Phys. Globe, Univ. Paris IV, Paris, Fr. Earth and Planetary Science Letters (1972), 16(1), 75-80. Strontium concentrations and strontium-chlorinity ratios in seawater of the North Pacific and the adjacent seas of Japan. Nagaya, Yutaka; Nakamura, Kiyoshi; Saiki, Masamichi. Dep. Environ. Contam., Natl. Inst. Radiol. Sci., Japan. Journal of the Oceanographical Society of Japan (1971), 27(1), 20-6. Marine barite and celestite saturation in seawater. Rushdi, A. I.; McManus, J.; Collier, R. W. College of Oceanic and Atmospheric Science, Oregon State University, Corvallis, OR, USA. Marine Chemistry (2000), 69(1-2), 19-31. Trace elements in acantharian skeletons. Brass, G. W. Rosenstiel Sch. Mar. Atmos. Sci., Univ. Miami, Miami, FL, USA. Limnology and Oceanography (1980), 25(1), 146-9. Morphologies and transformations of celestite in seawater: the role of acantharians in strontium and barium geochemistry. Bernstein, Renate E.; Byrne, Robert H.; Betzer, Peter R.; Greco, Anthony M. Dep. Mar. Sci., Univ. South Florida, St. Petersburg, FL, USA. Geochimica et Cosmochimica Acta (1992), 56(8), 3273-9. Marine celestite and the role of acantharians in oceanic strontium and barium geochemistry. Bernstein, Renate Ellen. Univ. of South Florida, Tampa, FL, USA. Avail. UMI, Order No. DA3001934. (2000), 125 pp. From: Diss. Abstr. Int., B 2001, 62(1), 117. Coprecipitation of cations with calcium carbonate. Coprecipitation of strontium(II) with aragonite between 16 and 96.deg. Kinsman, David J. J.; Holland, Heinrich D.. Princeton Univ., Princeton, NJ, USA. Geochimica et Cosmochimica Acta (1969), 33(1), 1-17. Strontium distribution in Geosecs oceanic profiles. Brass, Garrett W.; Turekian, Karl K. Dep. Geol. Geophys., Yale Univ., New Haven, CT, USA. Earth and Planetary Science Letters (1974), 23(1), 141-8. Acantharian fluxes and strontium to chlorinity ratios in the North Pacific Ocean. Bernstein, R. E.; Betzer, P. R.; Feely, R. A.; Byrne, R. H.; Lamb, M. F.; Michaels, A. F. Dep. Mar. Sci., Univ. South Florida, St. Petersburg, FL, USA. Science (Washington, DC, United States) (1987), 237(4821), 1490-4. Comparative analysis of vertical distribution patterns of epipelagic radiolaria, chlorophyll, and zooplankton in different regions of he North Atlantic Ocean (June-Sept. 2001). Zasko, D. N.; Vedernikov, V. I. Inst. Okeanol. im. P. P. Shirshova, RAN, Moscow, Russia. Okeanologiya (Moscow, Russian Federation) (2003), 43(1), 69-77. Biological minerals formed from strontium and barium sulfates. III. The morphology and crystallography of strontium sulfate crystals from the colonial radiolarian, Sphaerozoum punctatum. Hughes, N. P.; Perry, C. C.; Anderson, O. R.; Williams, R. J. P. Inorg. Chem. Lab., Univ. Oxford, Oxford, UK. Proceedings of the Royal Society of London, Series B: Biological Sciences (1989), 238(1292), 223-33, 3 plates. Macromolecular assemblages in controlled biomineralization. Perry, C. C.; Fraser, M. A.; Hughes, N. P. Chem. Dep., Brunel Univ., Uxbridge/Middlesex, UK. ACS Symposium Series (1991), 444(Surf. React. Pept. Polym. : Discovery Commer. ), 316-39. Transmission and scanning electron microscopic evidence for cytoplasmic deposition of strontium sulfate crystals in colonial radiolaria. Anderson, O. R.; Perry, C. C.; Hughes, N. P. Lamont-Doherty Geol. Obs., Columbia Univ., Palisades, NY, USA. Philosophical Transactions of the Royal Society of London, Series B: Biological Sciences (1990), 329(1252), 81-6. The effect of strontium on embryonic calcification of Aplysia californica. Bidwell, Joseph P.; Kuzirian, Alan; Jones, Glenn; Nadeau, Lloyd; Garland, Lisa. Howard Hughes Med. Inst., Woods Hole Oceanogr. Inst., Woods Hole, MA, USA. Biological Bulletin (Woods Hole, MA, United States) (1990), 178(3), 231-8. Statoconia formation in molluscan statocysts. Wiederhold M L; Sheridan C E; Smith N K Division of Otorhinolaryngology, The University of Texas Health Science Center at San Antonio, USA SCANNING ELECTRON MICROSCOPY (1986), 2 781-92. Strontium is required for statolith development and thus normal swimming behavior of hatchling cephalopods. Hanlon, Roger T.; Bidwell, Joseph P.; Tait, Richard. Mar. Biomed. Inst., Univ. Texas Med. Branch, Galveston, TX, USA. Journal of Experimental Biology (1989), 141 187-95. Growth increments and biomineralization process in cephalopod statoliths. Bettencourt, Vera; Guerra, Angel. Instituto de Investigaciones Marinas (CSIC), Vigo, Spain. Journal of Experimental Marine Biology and Ecology (2000), 248(2), 191-205. The effect of algal symbionts on the accuracy of Sr/Ca paleotemperatures from coral. Cohen, Anne L.; Owens, Kathryn E.; Layne, Graham D.; Shimizu, Nobumichi. Department of Geology and Geophysics, Woods Hole Oceanographic Institution (WHOI), Woods Hole, MA, USA. Science (Washington, DC, United States) (2002), 296(5566), 331-334. An assessment of the Sr/Ca ratio in shallow water hermatypic corals as a proxy for sea surface temperature. Marshall, John F.; McCulloch, Malcolm T. Research School of Earth Sciences, Australian National University, Canberra, Australia. Geochimica et Cosmochimica Acta (2002), 66(18), 3263-3280. Causes of changes in seawater 87Sr/86Sr from the study of Sr isotopes of loess from Chinese loess plateau. Su, Xiao-Yun; Yang, Jie-Dong; Chen, Jun. Department of Earth Sciences, Nanjing University, Nanjing, Peop. Rep. China. Nanjing Daxue Xuebao, Ziran Kexue (2003), 39(3), 327-336. Biogeochemical deposition of strontium. Odum, Howard T. Publs. Inst. Marine Sci. (1957), 4(No. 2), 38-114. From: Biol. Abstr. 33, Abstr. No. 530 (1959). Kinetics of strontium uptake in the scleractinian coral Stylophora pistillata. Ferrier-Pages, Christine; Boisson, Florence; Allemand, Denis; Tambutte, Eric. Centre Scientifique de Monaco, Monaco, Monaco. Marine Ecology: Progress Series (2002), 245 93-100. The strontium, magnesium and sodium composition of Recent scleractinian coral skeletons as standards for palaeoenvironmental analysis. Swart, Peter K.. King’s Coll., Univ. London, London, UK. Palaeogeography, Palaeoclimatology, Palaeoecology (1981), 34(1-2), 115-36. The effect of seawater chemistry on the growth of some scleractinian corals. Swart, Peter. King’s Coll., Univ. London, London, UK. Editor(s): Tardent, Pierre; Tardent, Ruth. Dev. Cell. Biol. Coelenterates, Proc. Int. Coelenterate Conf., 4th (1980), Meeting Date 1979, 203-8. Low temperature x-ray microanalysis of calcium in a scleractinian coral: evidence of active transport mechanisms. Clode, Peta L.; Marshall, Alan T. Analytical Electron Microscopy Laboratory, Department of Zoology, La Trobe University, Melbourne, Victoria, Australia. Journal of Experimental Biology (2002), 205(22), 3543-3552. Developmental effects of barium exposure in a marine bivalve ( Mytilus californianus ). Spangenberg, Jill V.; Cherr, Gary N. Bodega Marine Lab., Univ. California, Davis, CA, USA. Environmental Toxicology and Chemistry (1996), 15(10), 1769-1774. Experimental study on the acute toxicity of cobalt, antimony, strontium and silver salts in some Crustacea and their larvae and in some Teleostei. Amiard, J. C.. Dep. Prot., CEA, St.-Paul-lez-Durance, Fr. Revue Internationale d’Oceanographie Medicale (1976), 43 79-95. Phototactic variations in crustacean larvae due to diverse metallic pollutants, demonstrated by a sublethal toxicity test. Amiard, J. C.. Dep. Prot., Commis. Energ. At., Fontenay aux Roses, Fr. Marine Biology (Berlin, Germany) (1976), 34(3), 239-45.